I'm not sanguine on this one, because of my preoccupation with water albedo. There are many sides to Arctic amplification of radiative forcing . One is that the patchier the ice cover, the more low angle sunlght ends up in the water- swiss cheese melts down more readily than cheddar. Neven's Arctic sea ice blog looks a little more optimistic, although Neven himself is not. As does https://sunshinehours.net/. Kinda seems like, for the moment, arctic ice has settled into a new regime. Maybe. But even a thin cover of ice makes quite a difference. I looked for some comment on this, there, and didn't find any. When you say "optimistic" do you mean, for the prediction, or for the life of the sea ice? 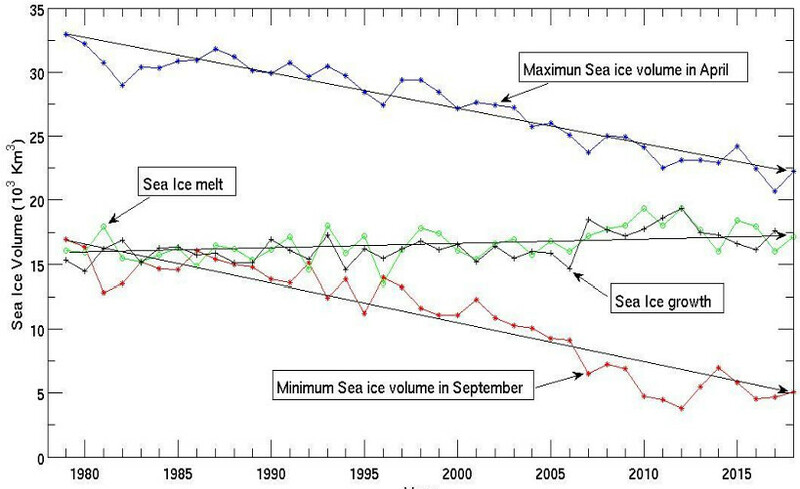 When will be the first year that daily ice volume per PIOMAS goes below 1000 km^3? Perhaps community is giving a little more credence to 2030 and later dates more recently but still looks rather alarmist to me. "The cumulative FDD sea ice thickness-based estimations revealed a quasi disappearance of the MYI for 2018"
I agree, it does seem somewhat strange that they don't seem to consider possibility of gompertz shaped curve as a possible alternative to straight line decline. Possibly some selection bias in those who take part. Haven't found similar one for Sept PIOMAS data, but PIOMAS data is available if you want to do it yourself. I am inclined to think that how the maximum changes gives good clues about what is likely to happen. Get rid of thick multiyear ice(MYI) and it does not come back. Melt thin FYI and it bounces back each winter. So the disappearance of MYI can be a fast rate of decline and when thick MYI is all but gone you are back to a slow rate of decline. And, this seems to be showing up in the data. That ought to be close to game over for the arctic ice alarmists but perhaps unsurprisingly they are not keen to embrace it, or at least not very quickly.